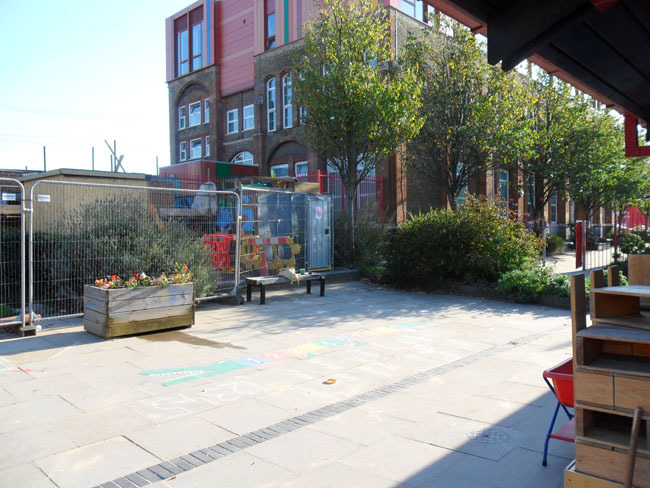 A totally sustainable school outdoor play and learning area in Tower Hamlets. All our personally crafted and hand made Bespoke School Playgrounds are constructed from FSC Premium graded Timber from renewable sources. Another point of interest is that on all projects, existing items in the school playground are reused or recycled when ever possible. All the timber structures, decking, raised planters, timber arbours, outdoor timber buildings were all bespoke constructed on site from Certificated Premium Grade timber which is all gathered from licensed renewable sources under international government procedures. Wigwams, pyramid climbing frame, tunnels and gothic wendy houses. See the bottom of the page for a fuller explanation. Click on the images below to see a slide show. 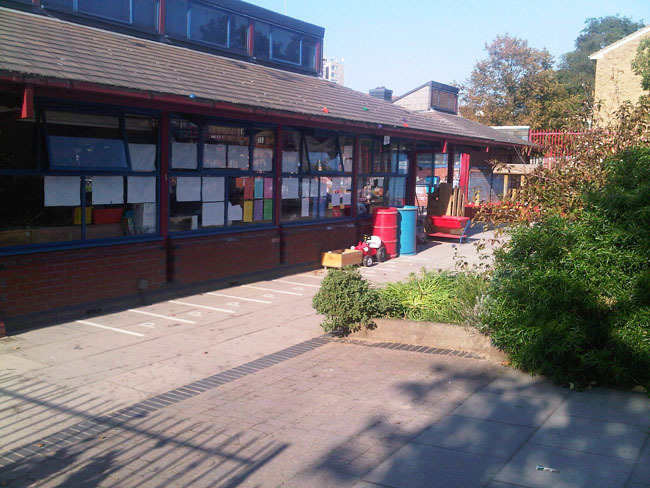 You may also be interested in having a look at our Main Playground Portfolio. In order to allow maximum visibility of the plants and permit facile minimum maintenance, timber planters of varying heights and sizes were constructed on site. 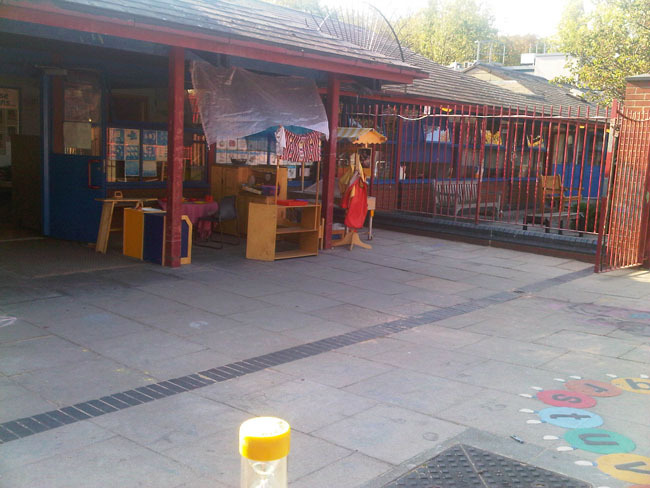 This playground was previously a large area of concrete paving and asphalt (see below). it would have been possible to dig out the entire area to a depth of 2 feet, to fill with top soil and then to lay a cultivated turf. However, over such a large area, this would have been prohibitively expensive and the children would not have been able to play on the lawn until it had settled (a period of 3 months). It was therefore decided to use a good grade of artificial lawn, which was laid directly on top of the existing asphalt and concrete areas. It was however necessary to dig out the ground immediately surrounding the activity platforms; these areas were dug out and the ground was covered with shock pads, on all sides of the activity platforms. The artificial lawn was then laid over the entire area, including the shock pads (which of course had been laid flush with the surrounding ground, to avoid any ridges when the lawn was laid). When laying the artificial grass, care was taken over manholes and existing drains. The finished result of the artificial lawn throughout the whole garden was that it unified all the areas with the appearance a soft and lush green sward. Seating for both children and adults is probably the most overlooked item in all school playgrounds. In this playground, the children have long low bench seats in each individual area. These serve as both places to rest or as places to sit and view the activities. Waterproof seating arbours are now positioned in many places throughout the various areas of this playground. These arbours are useful for sitting in shade or as protection from rain, for both children and adults. Outdoor cooking is a favourite for all ages. For school children, it is an added opportunity to sit together and eat together a selection of hand cooked foods. An outdoor fire-pit barbecue also teaches children the essentials of risk with fire. The sensory smells from a barbecue are most invigorating and memorable for the children, most of whom are living in apartments. Thus an outdoor barbecue is quite a thrill for the children, for many reasons. So many children's games revolve around a playhouse. Playhouse games are endless. In this playground, we constructed one of our traditional pyramid roof playhouses, with a timber floor and small verandah; the whole surrounded by timber planters with colourful sensory plants. In order to further increase the children's ability for adventure, self expression and challenges, a rock climbing pyramid was consyructed. Carefully selected sandstone rocks, from the Jurassic period, were used. Many of these rocks contain fossils of plants and animals from the Jurassic period. Children are fascinated with digging endlessly. To this end, a dirty digging area was constructed, , complete with a small ''lean-to'' timber shelter, a variety of Jurassic rocks and a number of low log seats. 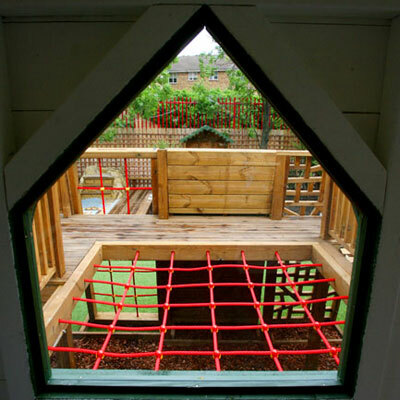 Small timber tunnels were constructed and positioned in different areas of the playgarden. For sheer adventure and endless games of imagination, we constructed two rustic wigwams. It was necessary to separate each individual play are but without impeding the ability to supervise and watch the children at all times. A perfect solution was the construction of low trellis fences, many of which were covered with scented evergreen climbers. From time immemorial, arches have symbolised the entry from one area into another. Arches throughout this play garden, represent entries into different exciting areas. These arches also serve to add natural height in this very flat playground. All the arches were covered with a variety of flowering sensory climbers. For children using the tricycles a pergola was constructed over one corner of the Magic Mosaic Pathway. Children are always speechless when they see a Magic Mosaic Pathway, which totally epitomises the whole feeling of a children's playground. Our mosaic designs and our mosaic patterns are endless. 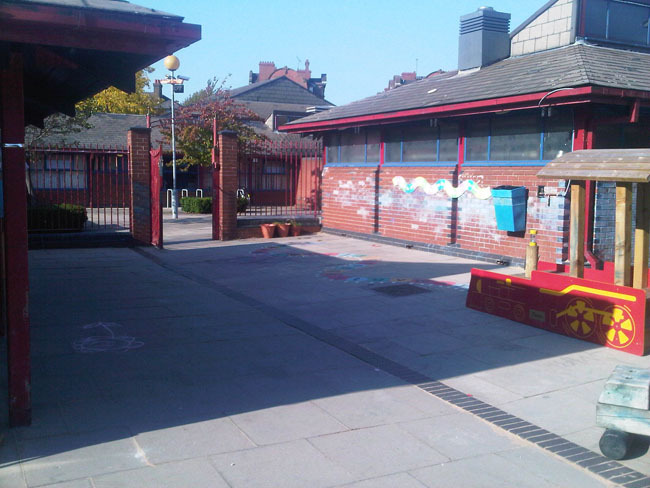 The designs in this pathway were partly as requested by the school and partly by ideas as the pathway developed. Using Magic Mosaics for the central area, a water cascade was created down a series of natural stone steps. The surrounding area was constructed from timber decking. Thus the children now play in bare feet on the decking and in the water rill. Children and sand go hand in hand! This was a totally open playground with no shelter or shade whatsoever. One of the main requirements was for the children to have a sandpit. Ttherefore, an octagonal cedar shingle pavilion was constructed and built with a sandpit underneath. The original playground had no shelter or shade from the changing weathers. There was also no outdoor learning room. One of the main criteria from the Head and the Governors was the necessity for a central outdoor shelter and learning room. It was necessary for this to blend into our whole natural concept of this playground. Therefore, a a large outdoor pavilion was constructed. This, in turn was softened with external palm trees, the artificial lawn and by the surrounding Magic Mosaic Pathways. The underlying requirement for this old concrete playground transformation was that the new playground should be green, verdant and full of plants, trees and flowering plants. Most adults forget that a child's perspective and view of life is 2000 miles distant from that of an adult ! Thus a medium size tree or shrub will appear as massive to a child. Therefore it was essential that all the chosen plants in this garden, were exciting but not ''scary''. There is a very fine dividing line in a child's mind between adventure and excitement and between an item which they find ''scary''. In this garden, emphasis was put on low trees which the children will find as ''soft'' and ''friendly''. All the plantings are sensory with an all year entertainment value. Another main criteria from the Head was that this new playground should assist the children to comprehend the basics of sustainability. therefore a central vegetable, herb and fruit garden was constructed. This is accessed under an arch which leads to the raised plant beds which contain the various all year vegetables, herbs and fruits. The main feature of this playground is obviously the stunning planting. An automatic micro irrigation system was installed which slowly feeds the trees and plants. Prior to the commencement of this project, the children were asked for their wishes in their new playground. The three main items they requested were flowers, trees and climbing areas.